A sight no Liverpool fan wanted to see, Mohamed Salah left the Olimpiyskiy National Sports Complex in Kiev, Ukraine in tears just after 30 minutes of play between Liverpool and Real Madrid in the final of UEFA Champions League 2018. The ‘Egyptian King’ was pulled down by Los Blancos captain Sergio Ramos and appeared to fall on his arm a bit awkwardly. After a small break, Salah came back on but went down again almost immediately. 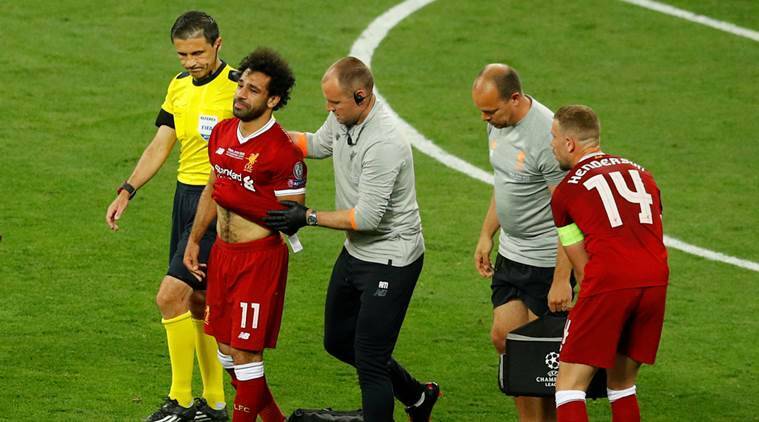 Realising he would have to miss out on the rest of the final, a distressed Salah was reduced to tears as he left for immediate treatment. The 25-year old Salah was substituted by Adam Lallana, who has played only 16 minutes since March because of injury. With both the teams not opening the scoreline, Liverpool fans had their heads in their hands as they saw their hero Salah walk straight down the tunnel to the dressing room. The incident drew back memories of Cristiano Ronaldo going off with injury in Euro 2016 final. Later in the first half, Zinedine Zidane also lost a player as Dani Carvajal went down while trying a backheel to Ronaldo. Carvajal, who had his head down and looked as distressed as Salah, was replaced by Nacho Fernandez. Egypt’s Salah and Spain right-back Dani Carvajal are both now in a race to be fit for the FIFA World Cup in Russia next month.